We typically meet with many federal employees and/or government contractors who are faced with security concerns or potential security concerns in obtaining, retaining or applying for a security clearance. These individuals often ask our attorneys at what point they should retain a security clearance attorney to assist, advise or represent them. This article discusses this topic. The short answer to the above question is that an individual with potential security issues should speak with experienced security clearance counsel as soon as possible if issues do or may arise. In our experience, the earlier that an individual with security concerns or potential security concerns consults with a knowledgeable security clearance lawyer, the better chance they have to avert a negative outcome. We also find that it is less expensive to address a negative security concern early before it becomes more difficult to defend or respond to later in the process. What Does a Security Clearance Lawyer Do? Many times we are asked about how an attorney can assist a person in the security clearance process. The answer is that there are many ways that an experienced lawyer in security clearance law can help when there are security concerns. A lawyer experienced in the security clearance process can advise an individual before a security clearance problem develops. We have found that most individuals have a good sense as to whether or not they may have a security concern (e.g. a recent arrest, drug use, financial issues) as they apply for positions or when they fill out security clearance forms like the e-QIP, SF-86 and/or different variations of the SF-85. Sometimes individuals don’t weigh (or really plan out) how much a potential security issue can affect their ability to obtain a clearance. Having a security clearance lawyer advise a person about the process can be invaluable. When an individual understands that they may have a potential security issue, consulting with a security clearance lawyer can help them get ahead of potential security clearance concerns. One of the major problems that we see in the clearance process is when an individual comes to us too late in the process to alter a negative clearance outcome. 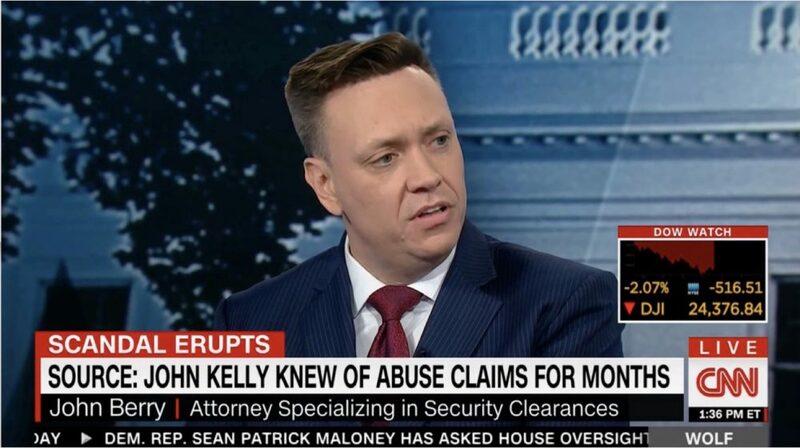 We have seen individuals that could have likely obtained or retained their security clearance but did not seek legal advice early enough in the process to make a difference. Sometimes, individuals have had financial issues which could have been explained, but the individual did not realize what type of information was needed for their response and then are left with few options for an appeal. On other occasions, individuals have security concerns but have not listed them because they did not feel they were important (i.e. a previous arrest or termination). Getting advice on these issues early is the key. When consulting with an individual, a security clearance lawyer can get a good idea as to the seriousness of the security concerns at issue and what level of risk is involved in the person applying for a security clearance. In the case of a person who has the option to apply for a clearance, but more time might be needed to mitigate security concerns we can help the person avoid the potential of a denial. In this type of situation, we sometimes advise individuals to wait a year or a few months before applying for or taking a position that requires a security clearance. It is also not uncommon that we anticipate a serious issue with someone obtaining a security clearance, i.e. recent criminal charges, which helps them avoid the embarrassment of applying for a position that they may get only to be removed later when their clearance is not approved. A security clearance lawyer can also help to put an applicant’s mind at ease if the risk they are concerned about is not as significant as it seems. Additionally, a security clearance lawyer can help review an individual’s security clearance forms to ensure that they are accurate and responsive and consult with them about what to expect. It is critical to disclose all potential information, accurately, on these forms. Not doing so can form the basis for a denial based on a lack of candor or honesty. We often see issues arise from the omission of key information that may not seem to be important (or remembered) at the time the security clearance forms were prepared but later becomes the basis of a clearance denial. Furthermore, while rare, it sometimes can be important to discuss potential criminal disclosures in advance. It is not often the case that disclosures about criminal activity become the basis for a criminal prosecution, but sometimes these questions need to be asked before completing a clearance submission. In other words, if an individual has a potential security concern it is key to get legal advice early in the process, not late. It is also very important to have the guidance of a security clearance attorney when the security clearance process has begun. The security clearance forms in such a case have been submitted and the individual has potential security concerns, i.e. a record of arrests or financial issues and is in the process of being scheduled for an investigative interview. In such a situation, it is important to go over the areas of concern with a client that is likely to come up in the interview with a security clearance attorney. There are often ways of responding during an interview that can clear up any misperceptions by the investigator or perhaps mitigate these concerns in advance. Again, it is extremely important to be honest during the security clearance interview process and sometimes to even disclose concerns before the interview begins in certain cases. An experienced security clearance lawyer can help advise an individual about these issues and disclosures before they are interviewed. We often review such concerns with clients in advance of security clearance interviews and help them in explaining the security concerns, in advance, so that all goes as smoothly as possible during the interview or re-interview process. An individual will definitely need a security clearance attorney if they receive a denial or proposed denial of their security clearance. Each federal agency is different and there are different security clearance processes for each federal agency. This causes some confusion among clients. The security clearance system has been left to each federal agency under existing rules. The type of response needed will also differ based upon which federal agency is processing the clearance review. This is the case even though all federal agencies fall under the same Executive Order 12968. It is also important that the individual consult with experienced counsel where they can explain any issues that individual federal agencies are particularly sensitive to. For instance, the FBI is more sensitive to prior drug use by applicants or employees and many intelligence agencies are sensitive to the misuse or careless handling of classified or otherwise sensitive information. In other words, each federal agency has a different process and a different view on security concerns. Usually, each federal agency usually has a written and oral response stage for those who need to appeal a denial or proposed denial in the security clearance appeals process. While different, each federal agency will provide some form of a Statement of Reasons (SOR) or notice of revocation which explains the nature of the security concern at issue. Furthermore, while the procedures of a security clearance appeal are different between agencies, they follow the guidelines issued by the Director of National Intelligence (DNI), which became effective June 8, 2017. The DNI recently issued new adjudicative guidelines entitled Security Executive Agency Directive 4 (SEAD 4) which provides a list of potential security concerns and mitigation. A copy of the new DNI directive is provided here. Download SEAD4_20170608. A security clearance lawyer will be versed in the latest regulations governing such appeals (both federal government-wide and federal agency-specific) before the individual agency involved and will be able to assist a person in navigating the type of appeal to present. The typical first step in the security clearance process is to provide a written response to the security concerns to the clearance review authority. To do so, an experienced security clearance attorney will obtain a complete fact set from the individual regarding the security concerns at issue and work to determine the best possible methods of rebutting and/or mitigating these security concerns. There is also a “whole-person concept” review which counsel can assist with by explaining the positive aspects of an individual’s character and/or background which can also help to mitigate clearance issues. To this end, we also often we often ask a potential client about their employment performance, community involvement and/or whether or not they can obtain letters of recommendation or reference for use in mitigation. The written response usually takes the form of a written submission by counsel, exhibits, and attaches an affidavit or sworn declaration. It is not uncommon for such responses to be 10 to 70 pages in length, with exhibits. The length of a submission depends on the security concerns at issue and the type of mitigating documents that are available for a case. While it is very important to provide a detailed written response to alleged security concerns, it is even more important to present a thorough oral presentation where the opportunity to do so arises. We almost always recommend that an individual elect a hearing or personal appearance in security clearance cases. Again, the format for these presentations differ. Some federal agencies conduct formal hearings with an administrative judge (Department of Defense, Department of Energy) and other agencies have appeals panels (National Security Agency, Central Intelligence Agency, National Reconnaissance Office) staffed by agency employees which hear each case. Additionally, other federal agencies often appoint one adjudicator to hear informal appeals. In short, each federal agency has their own unique process for personal meetings regarding security concerns. Regardless of format, a security clearance attorney will prepare a client for their testimony and will prepare witnesses for their supporting testimony and potential cross-examination or questioning (where the forum permits in person witnesses). It is also very important to note that in many forums the federal agency will be represented by their own lawyer and it is very important for an individual to have their own counsel in the proceedings. We have found that the personal appearances have the greatest potential to reverse negative findings. The ultimate appeals officer, whether it is an administrative judge, an appeals panel or a hearing officer often finds the most important evidence by hearing directly from the individual involved. A security clearance lawyer will prepare a client for the questions that may arise and the best strategy for rebutting or mitigating them. When a federal employee or government is facing potential security clearance concerns it is important for them to obtain legal advice and legal representation. Our law firm advises individuals in the security clearance process. We can be contacted at www.berrylegal.com or by telephone at (703) 668-0070. Please visit our Facebook and Twitter pages. This entry was posted in Uncategorized and tagged retaining a security clearance lawyer, security clearance appeals, security clearance attorney, security clearance attorneys, security clearance lawyer, security clearance lawyers, Statement of Reasons, when to hire a security clearance lawyer by berrylegal. Bookmark the permalink.